A 99-year-old World War Two veteran, who is the world's oldest cancer survivor, today said "thank heavens - I've still got so much to do". Surgeon Mr Sanjaya Wijeyekoon carried out tests on the nonagenarian before operating to remove the deadly growth. When Mr Marston came round he was told the surgery had been successful and the tumour - which he knew nothing about - had been taken out. Twelve days on from the life-saving treatment, Mr Marston has been issued with a clean bill of health and is due to go home this weekend. The pensioner, who has already beaten bowel cancer twice in the last eight years, said: "After the surgery the doctors said they had cleared the blockage in my stomach and in doing so they had cleared the cancer as well. "I didn't know I had cancer. You often get no sign with cancer. "They told me 'you are now clear of cancer' and I said 'thank heavens for that, I've still got so much left to do'." The widower, from Ringwood, Hants, had been preparing to go on holiday to Torquay with two friends when he started being sick and suffering from stomach pain. His doctor called for an ambulance and he was rushed to the A&E department at the Royal Bournemouth Hospital. Mr Marston was found to be eligible to have surgery to clear his bowel despite his age because of his otherwise clean bill of health. Mr Marston said: "I can't believe I'm the oldest cancer survivor, they tell me it's outstanding. "You hear about neglecting old people and just letting them drift away, but if you want the opportunity to carry on it's here and they will keep you going as best they can. "If they can cure cancer at 100, they can do anything. "I'm not sure what the secret to a long life is but four years ago I was told by one of my doctors I was allowed a half pint of beer a day and I have, so maybe that's got something to do with it." Surgeon Mr Wijeyekoon said: "Mr Marston is a true inspiration. His story is remarkable and demonstrates the NHS's commitment to providing quality care to every single one of its patients, no matter their age or if it is the weekend. 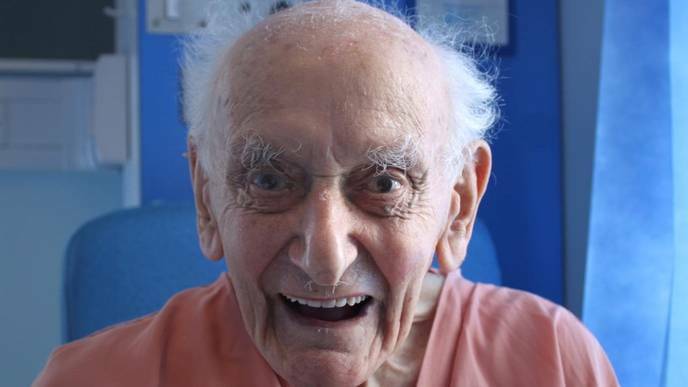 "Mr Marston is certainly the oldest cancer patient to be cured at the Royal Bournemouth Hospital. We have been researching for the past few days whether there is another cancer survivor older than him in the world, but we haven't found anyone who has beaten his record." Mr Marston, who is six months away from his 100th birthday, spent 15 years with the Territorial Army and served with the Queen Victoria Rifles, a motorcycle reconnaissance battalion, during the Second World War. After the war he worked as a legal clerk, helping to deal with people's estates before the power of attorney law came into place, and as an estate agent. He retired when he was 60. He lost his wife Doris nine years ago after a battle with Alzheimer's and his daughter Carol to a rare form of lung cancer when she was 58. His son-in-law Ray Wilshaw, 67, said: "Victor is a very positive person and until quite recently he was very active. "He still is but his knees have given way now so he has a mobility scooter to get around. "We can't believe he's the oldest cancer survivor, it's incredible. But he doesn't give up."